The refrigerant and air conditioning industry in India remains quiet about its moves post 2002 when it stops using chlorofluorocarbons. Is it also making plans to get 'compensation' to do nothing? And in this carnival of big business what chances do the owners of small-scale units have of surviving the protocol? Why no one will talk of them? WHILE the manufacturers of ODS hit their first deadline as far away as 2010 for the users of these chemicals the clock is ticking at a much faster pace. Those using chlorofluorocarbons (CFCs) in their products will have to stop selling, stocking, exhibiting for sale or distributing foam, refrigerators, mobile air conditioners and aerosols by December 31, 2002. There are only eight months to go. Once past the deadline, a refrigerator manufacturer will not even be able to stock a refrigerator made with CFCs. All of them will have to shift to alternatives. The alternatives suitable to the product vary from industry to industry. And so do the problems attendant with the transition in the industry. The solvent sector accounts for the maximum domestic consumption of ODS. Use of ODS in the aerosol sector is the minimum. The manufacturers are miffed at the idea of a cut off date for keeping stocks of ODS. They claim time to sell what has been manufactured till December 2002, allowing dealers and distributors breathing space to clear existing stock. But sources within the Union ministry of environment and forests (MEF) say the manufacturers were given nearly two years warning. They had sufficient time to get their act together. Though the deadline for developing countries to phase out CFCs is 2010, the process has been accelerated in India. It has its advantages. "The multilateral fund kitty is limited and the early bird gets the worm," explains Niyati. "Secondly, if the Indian industry is interested in tapping the export market, especially in the Middle East and Africa, it is necessary that it changes gears as fast as manufacturers elsewhere." The RAC sector promises to be one of the most problematic. The sector is one of the largest consumers of CFCs. Between 1995-97 the sector used about 2,770 MT of the total of about 6,600 MT of CFCs. There are many big players in this multi billion-dollar sector, including the multinationals that have joint ventures with domestic companies. For these multinationals, the Montreal Protocol has come like a boon. They have found in it the perfect tool to ditch their local partners and bring in the non-ODS using products on their brand names. Take the case of Whirpool and Kelvinator. They have a joint venture producing domestic refrigerators, with Whirpool, the US-based giant, holding 57 per cent of the equity. But Whirpool sells non-CFC refrigerators under their brand name. It's given Kelvinator a short shrift. For the domestic producers the problem remains that the price of importing alternatives has constantly risen. 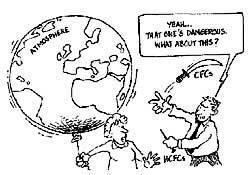 For example the cost of a kilogramme of HFC-134a - an alternative with zero ozone depleting potential - has risen from US $ 2.5 in 1997 to about US $5.5. TO help the industry in its phase out the government has secured phase out projects worth more than US $ 75 million from the multilateral fund under the protocol. The RAC sector is the biggest beneficiary of this largesse (see table: Money for nothing?). But what is it doing with this money? The industry refuses to divulge information. The producers of ODS-based goods too care little for making their actions public. Industry watchers fear that the industry, blinded with the money pouring in, has become shortsighted enough to choose HCFCs over better alternatives like hydrocarbons. The RAC industry's silence on the issue seems ominous. The aerosol sector on the other hand is easily dealt with. It is relatively easy to acquire and develop technology for the transition in this sector, which mainly involves using a different machine for filling the propellant. The substitutes, like liquefied petroleum gas, are even cheaper than the ODS currently used. The people engaged in the foam sector have also responded well, possibly because transition also implies upgrading. The industries using CFCs for foam blowing rely on mechanical ways, but using the substitute HCFC-141b requires computerised machines. They are happy to improve their work and their technology with grants. And the costs of using HCFC-141b are affordable. Cyclopentane, a hydrocarbon and a better option, is also gaining acceptance in insulating foam used in refrigerators. For the fire extinguishers sector though, the price of the best technology is too high. The industry is opting for domestically produced HCFCs blends and a variety of HFCs. The larger trend in the three sectors looks again to be that of a shift towards HCFCs. While the government in its country phase out programme has netted the larger players in the market, the government has all but forgotten the small-scale segment within the ODS-using industry. Small-scale businesses operate primarily in the refrigerant assembling and repairs industry or in the huge solvents industry. The government seems completely foxed about handling these businesses. MEF claims the sector is highly unorganised, widely scattered and too diverse in terms of its application in various industries. Even identifying the people in the trade is difficult. Putting a number to them is harder for the clueless government. Estimates range from 2,000-3,000, with 200 industries in Delhi alone. The government has only recently begun surveys to identify persons, workshops and agents engaged in this business. Following the identification, a phase out strategy is to be formulated. But, little or no money from the multilateral fund has been spent to ensure their transition as yet. The government does plan an umbrella project for a clutch of small-scale operators because the protocol disburses funds to units consuming 10 tonnes or more of ODS each year. But few wish to come forward fearing harassment and bureaucratic delays. The government seems content with just contacting industry associations like All India Air-conditioning and Refrigeration Association and Aerosol Promotion Council. These associations, with their well-established members, are anyway aware of the phase out process. It is the unorganised units, like that in the solvent industry, which should be targeted. The limited strategy of the government right now is to advertise in the media. The government's programmes, sadly, trust the grapevines to work for them. As a result only 307 small-scale industries in Delhi had registered with the ozone cell by July 19, 2001. Registration started way back in July 2000. Out of this, 296 are into refrigeration and air-conditioning. The other sectors have been left out. But the government has its argument ready for the lack of initiative. It says once ODS production is completely phased out, these businesses will be forced to make the change over. However, they will not be able to secure any financial assistance from the multilateral fund, it forgets to mention. Issues of safe handling of new coolants like hydrocarbons and training take priority here. Imparting skills to people in the servicing sector in the use of evacuation systems and making them aware of the option of recycling are two urgent tasks. The evacuation system is not expensive and can be easily manufactured domestically. At present, no infrastructure exists to recover ODS coolants and store it to prevent release into the environment before sending it back to the producers who have the facility to purify and reuse it. This aspect will gain more importance after 2010 when the large fleet of old refrigerators and air conditioners will have to be destroyed without releasing the coolants into the atmosphere. Moreover, not every end-user is expected to buy a new refrigerator operating on a non-ODS refrigerant when ODS-based refrigerators are available in the market till 2002. "Older refrigerators will have to be retrofitted," Niyati explains. "Facilities to do that are lacking and no one is paying attention yet." It's a problem even industrialised countries are just learning to deal with. The evidence against the logic of the Montreal Protocol is out there: it may be touted as the biggest successful case of international cooperation to save the environment. But the only people it has helped prosper are the ones to blame in the first place for the problems. So distant from the ground realities, the protocol can be enforced upon the moneymaking big businesses because it does not hurt them. But the thousands of small-scale industries - which form the bulk of the users of ODS in developing countries - either get left out of the loop or face a future in deep freeze. It is time the international community learnt from India's experience and not let environmental conventions be led by gluttonous desires of North-based multinationals.